Root Beer for Breakfast – Challenge Accepted! So a little bit ago, those fine root beer lovers, The Root Beer Brothers, issued a challenge. Have root beer and granola for breakfast. Not being one to back down from a root beer challenge (unless said challenge involves the words “can”, “plastic”, or “diet”) I went to the store and got some granola. I decided on a simple honey almond granola since I do like honey in my root beer. Then I needed to choose a root beer. I thought about A&W like the brothers, but they’d already done that so I figured I’d try something new. Since I like vanilla and honey I settled on Frostie Vanilla Root Beer, since it is ultra-vanilla creamy and there’s no honey flavor to it. I tried to find the Vance Gilbert “Root Beer for Breakfast” on Grooveshark to listen to, but it wasn’t there. Alas, I had to settle for “Root Beer” by George Jones. 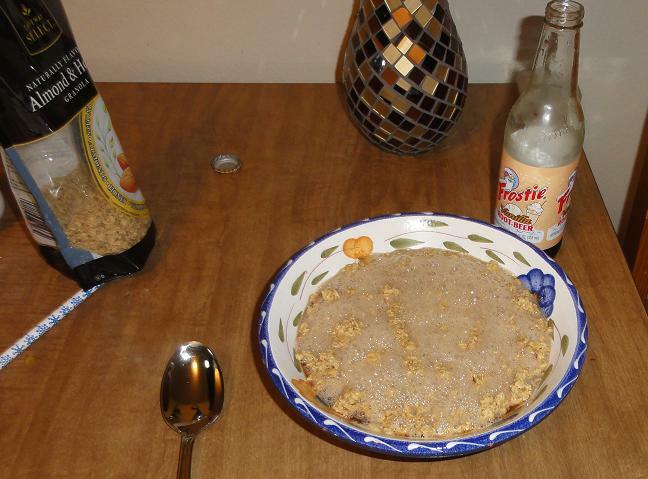 So with “Root Beer” on loop, I poured the granola and root beer. But when I finished I wished he’d stayed mute. 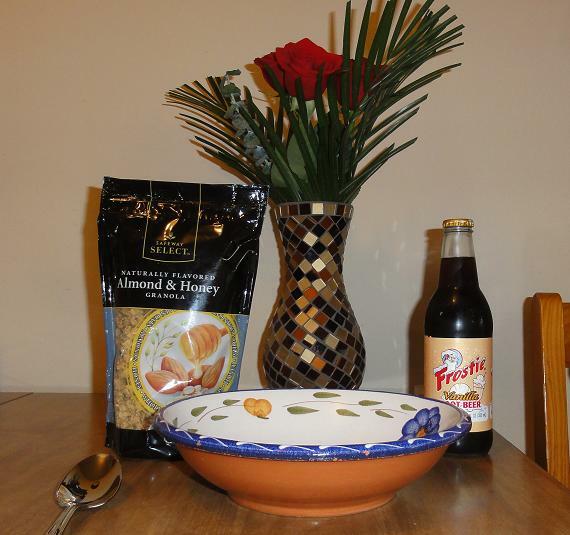 My bowl of granola and root beer.